n2y, a leading developer of education curricula and teaching materials for K-12 students with special needs, has been sold to The Riverside Company. 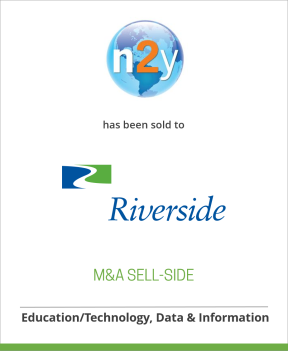 DeSilva+Phillips client, n2y LLC, a leading developer of education curricula and teaching materials for K-12 students with special needs, has been sold to The Riverside Company. Based in Huron, Ohio, n2y offers its products to teachers and school administrators through a cloud-based subscription platform. DeSilva+Phillips acted as co-advisor to n2y’s founders along with Managing Director Kevin Mayer and Director Andy Male from Western Reserve Partners LLC. n2y was founded in 1997, and Riverside will work with the management team to continue to deepen and expand the customer base, add complementary new products, enhance teacher training and development efforts, and pursue strategic add-on opportunities. “I have always led n2y with a sense of conviction, a knowledge that we could truly make a difference within the special education community. We have accomplished that goal, and I am now certain that The Riverside Company will continue that upward arch with our talented team, leading us to even greater achievements,” said Jacquie Clark, Founder and CEO of n2y. “This was one of the most sought-after companies that DeSilva+Phillips and Western Reserve Partners have had the opportunity to represent. The transaction is a home run for all involved. It partnered a high growth, respected ed-tech company that improves the lives of special ed students and teachers, with an expert and leading acquirer of successful education companies. I can’t wait to see what these two exceptional groups build in the coming years,” said Robin Warner, Managing Director, DeSilva+Phillips.